I'm sure you've read or even tried out the new app/social media network Vero by now. If not then the evaluative upshot of the app is that it's a mashup of Instagram and Google+ with a pinch of Facebook that gives you an ad free and chronological feed. Sounds good so far as, after all, algorithmic feeds are the current bane of every Facebook, Instagram, Twitter user and the dozen or so people left on Google Plus*. But while the idea is sound the implementation is less so. Like Instagram, Vero lives in an app. Their website is basically just a sales page letting you know why Vero is the next greatest thing. Nothing out of the usual there except for their app only sort of works. In my time with the app, which admittedly has only been roughly 2 days, searching for users returns every user that has a first or last name that matches with either the first or last name of the person you searched for if it returns anything at all, it takes nearly a minute for a user's profile to actually load any of their content, and this is if the app will even open correctly. I get that many of these issues are related to a higher than expected amount of users signing up but with how fickle the internet and its users are this isn't a good first impression of the app. 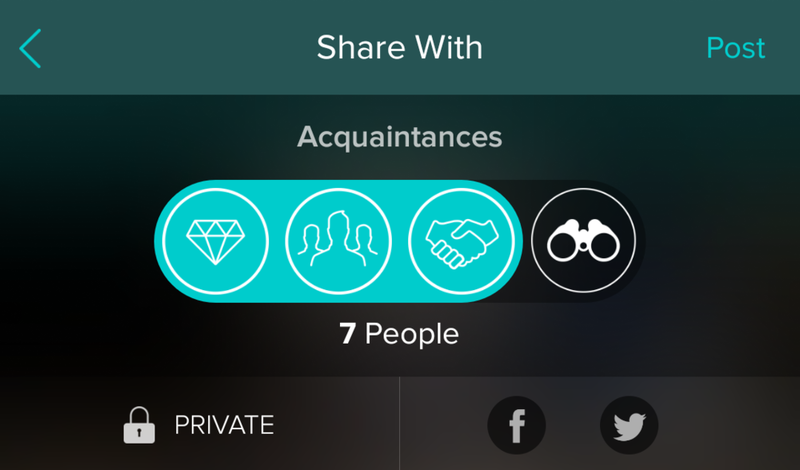 Vero is selling itself as the "true social" network with "smarter connecting." The idea is similar to Google+ circles in that if you connect with someone, similar to sending a Facebook friend request in that both parties must accept the connection, you add them to one of three groups Close Friends, Friends, or Acquaintances. This is supposed to give you control over who you share your content with but the system works in a hierarchical nature meaning its more of a sliding scale of privacy vs choosing particular groups. For instance, sharing a image with Friends means those in the Close Friends and Friends group can see the image while sharing with Acquaintances means all three groups can see the image. If you wanted to share with only the Friends group then well, tough. You also don't seem to be able to create additional groups nor rename existing groups. Followers are more akin to well... Followers in Instagram. Anyone can follow you and you can follow anyone else. They don't have to accept any sort of request nor do both parties have to follow each other. This is where things get confusing, because connecting with someone doesn't mean you're following them and once you connect with someone you also seem to be locked out from following them. This won't affect what content you see of theirs as followers are the bottom rung of the aforementioned connection hierarchy so anything shared with followers is also shared with all the connection groups. This wouldn't necessarily be a problem except connections aren't currently reflected in the followers count, the only count visible to users, and since social media is entirely a numbers game actually connecting with someone is less valuable then just having them follow. Vero has yet to announce when it'll switch to a subscription based platform or how much the subscription will be. Users signing up currently are getting the service for free for life until Vero decides to end that deal. Honestly, I have no idea how a subscription based social media network survives in a market where there's a plethora of other networks to choose from that offer similar if not identical services for "free" (selling of personal data and ads notwithstanding). Time will tell if people are willing to par for a non-monetized, non-algorithmic feed but either way it's going to be a hard uphill battle for Vero.